Selecting new flooring for specific rooms in your home is fairly straightforward. With Colorado’s two-story living, many families lay hardwood on the main level to cover living space, kitchens, and dining rooms. Then they opt for softer, warmer carpet in the upstairs bedrooms. But what about the stairs leading up from the main level to the second? Should you cover them with hardwood? Or should you cover them with carpet? While hardwood creates a sleek, modern feel to your home and can present a dramatic entry to your home, they can also be dangerous. Hardwood stairs can be slippery. And if you do fall, there isn’t any cushion. If you have children or seniors in your home, that can be a problem. Having carpet on the stairs doesn’t necessarily prevent falls, but it will provide more traction and cushion the fall if it happens. If you carpet your stairs, look at the thickness. Carpet that is too thick can become a tripping hazard over time. Also look for a low-pile carpet to ensure safety. You can compromise between the two and install stair treads, which are non-slip pads installed on your hardwood stairs. They provide style, safety, and functionality. Wood flooring provides a low maintenance option for your home. Hardwood doesn’t accumulate dust or allergens in the same manner as carpeting, and cleaning involves occasional sweeping and mopping. Carpeting your stairs requires more work. Since carpet can harbor dirt and dust, it is important to use a high quality vacuum on a regular basis. Stains are inevitable with carpeting, so it’s also a good idea to have a spot cleaner at hand, especially if you have an active household with pets and kids. Your stairs are often one of the highest traffic areas in your home. Carpet can start to show that wear very quickly if you don’t select the right carpet for the job. Pick colors that can handle daily use. Darker colors can help repel dirt and make it look cleaner for the long term. Texture can also help you hide wear and tear. While hardwood keeps its good looks for years, think about your daily activity. Pets nails can wreak havoc on hardwood, especially if they are up and down all day. And because hardwood is slippery, it can be more dangerous for pets to move around your home, especially if they are older. Wood stairs don’t provide much sound absorption. You may hear every step being taken, no matter what time of the day. Carpet serves as an insulator, blocking out sounds that are more noticeable. To create a quiet environment, carpet is the logical choice. This is where your personality comes into play. What are your preferences? What style represents your home? 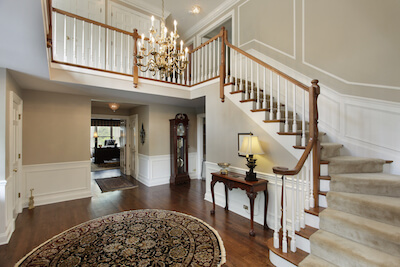 For homes with dramatic entryways and hardwood throughout, carpet staircases can feel outdated and out of place. If your home has a mixture, carpeting may be the better choice.